UFO SIGHTINGS DAILY: UFO Explodes Over ISIS Territory On May 2016, Video, UFO Sighting News. UFO Explodes Over ISIS Territory On May 2016, Video, UFO Sighting News. This video shows an object falling from the sky slowly and at an angle that fits that of a UFO or space junk falling more than that of a meteorite, but its explosion makes me think meteor. Are aliens trying to attack ISIS to protect the world or was this a meteor? Tell us your thoughts on this one in the comments bellow. 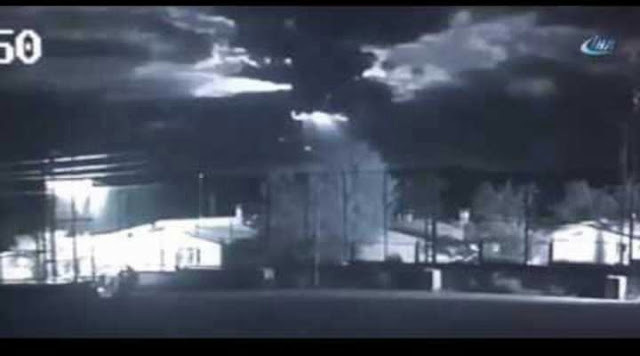 Intriguing security camera footage from Turkey shows a mysterious glowing object briefly descending through the air before seemingly exploding and lighting up the night sky. The event occurred in an area of the country that is near the Syrian border and very close to a region currently controlled by ISIS. Despite what appeared to be an enormous blast, local officials claim no debris was found in the area and suggested that it was a natural event.